We are a Welcoming Congregation, recognized by the Unitarian Universalist Association. 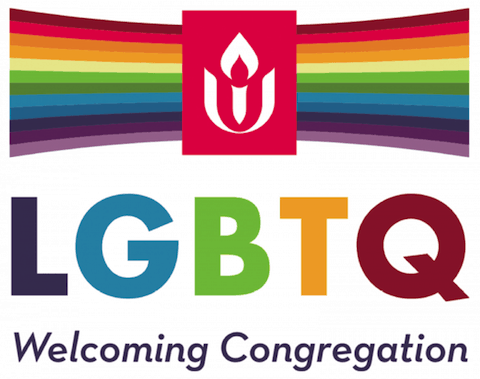 This means we affirm and include people who are lesbian, gay, bisexual, transgender, and queer at every level of congregational life — in worship, in program, and in social occasions — welcoming them as whole people. Children, adults, young and not so young – we welcome you. Single, married, divorced, widowed – we welcome you. Poor, rich, and everywhere in between – we welcome you. Physically challenged, able-bodied, hearing-impaired, vision-impaired – we welcome you. Existentialist, transcendentalists, environmentalists – we welcome you. Gay, lesbian, bisexual, straight, transgender – we welcome you. Native American, African American, Asian, Caucasian, Hispanic, multiracial – we welcome you. Theist, atheist, non-theist, polytheist, agnostic, pagan – we welcome you. Unitarian Universalist, Jewish, Christian, Muslim, Buddhist, Hindu – we welcome you. We welcome all who strive for truth, justice and peace. We welcome all who strive for wisdom and compassion over anger and hatred.